Use a unique card feature to create the card. Plus get funny card sayings, card making instructions, and an alternate design. There are may ways to express "I miss you." But sending out a missing you card is still one of the best ways. Additionally, this particular card is special because it’s unique and humorous. The card hinges at the corner instead of the edge. And, this little feature relates to one of the many simple ways of creating unique cards. This blue card is also a funny card. 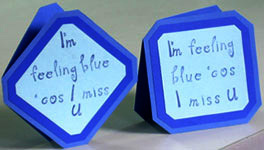 Because it expresses that the person sending the card feels blue too. Since there’s already one funny statement in front of the card, put another funny one inside the card. Not sure what to put down? Don’t worry. There are a few ideas below. One cool idea is to complement the funny phrase in front with another amusing expression inside the card. before I start singing the blues. Next, let’s create the card. 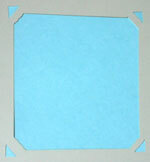 On the 3.75” x 3.75” pastel blue cardstock paper, use pencil to mark off 5/16” from the left and right of all corners. Cut off these tiny 45° pieces from all the corners. Turn this piece of cardstock 45° so that the edge becomes the highest point, use the rubber stamps and blue ink pad to print “I’m” on the topmost corner. 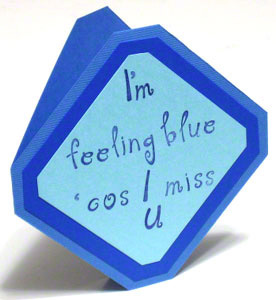 Next, rubber stamp “feeling blue” on the next line. Then, print “ ‘cos I miss” on the third line. Finally, rubber stamp “U” on the bottom corner. On the 4.5” x 4.5” Blue Mediterranean cardstock paper, use pencil to mark off 9/16” from the left and right of all corners. 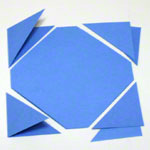 Glue the pastel blue cardstock to the 4.5” x 4.5” Blue Mediterranean cardstock, making sure the edges have even margins. Score the 6” x 12” slate blue cardstock paper right in the middle and fold into a 6” x 6” card. On this folded piece, use a pencil to mark off points that divide each edge into three parts with 1” in the middle and 2.5” on the left and right. These points represent the 45° edges for the finished card. Cut off these 45° edges from all the corners. This transforms the 6” x 6” square into a 5” x 5” square. 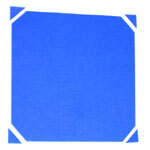 Finally, glue the completed 4.5” x 4.5” Blue Mediterranean cardstock on top of the slate blue cardstock. And make sure the edges have even margins. With that, the unique miss you card is finished. So, inside the card, put down whatever feels right to you. Ever wondered what this card would look like if the words read from left to right instead of from top to bottom? Well, I was wondering the same thing. So I made another card afterward. ...Just to satisfy my curiosity. In essence, with either style you pick, it’s still a cool, unique, and funny card.